The Oromo nation is one of the indigenous peoples of East Africa. Throughout long history it has developed its own culture, identity, religious cult and ritual performances. Comprehensive understanding of the Oromo culture, politics and other living conditions can be attained through close examination of the Gada system. By the same token, one can fully understand and analyze Irreechaa ceremony from the view point of its relations to Gada system and Qaalluu institution. The Gada system has incorporated social, political, economic and religious set-up and is built in complexity, out of which Irreechaa is the one. Irreechaa means literally worshipping and praying to the Waaqaa (Creator). This worship and pray would be accomplished at different places and time governed by its own system. It is portrayed by its own ritual practices. In this aspect of Waaqeffannaa worship, the Qaalluus (the spiritual leaders) and the Abba Malkaas (Lineal Chiefs of the areas) are at the top hierarchies. In the Qaalluu religio-ethics, the Qaalluus give instructions and directives of the where about and the time of the implementation of the ritual. Irreechaa Tulluu (Irreechaa that is performed at the top of the mountains) during the eve of the wet season (Afraasaa), and Irreechaa Malkaa (Irreechaa that is performed along the river bank.) in September (at the beginning of Birraa). Irreechaa Tulluu – It is the ritual ceremony conducted on the top of the mountain. It is performed at the beginning of the spring season usually in the month of March as December, January and February are sunny months when both men and cattle suffer from drought (shortage of water and grasses). So, it is the time when the Oromo living in the vicinity are gathered to pray to their Waaqa /creator/ to give them rain. This particular solitary place is characterized by moisture conducive for praying. This ritual ceremonial practice is said to have closely related to the worship practiced by ancient settlers of peoples of the Nile Valley. Irreechaa Malkaa (Irreechaa along the River Bank): This Irreechaa practice takes place immediately after the end of rainy season. It is celebrated in the mid of September (Fulbaana) when the darkness of rainy season with its foggy days passes and leaves place for bright season (Birraa). Such ritual ceremony is accomplished not only along the bank of river, but also around the lakes and its vicinities. Irreechaa holiday is Sometimes known as Ayyaana Birraa (the Birraa holiday). It is the time when relatives, families and clans cut apart by rivers and flood are able to meet. Still others call it Xaddacha Saaquu – traditional court openings season. Because, during the past rainy season the judges could not sit in the court to see the cases. Particularly, mountains and meadows covered with flowers and crops whose colors are so attractive and lavish to the farmers and pastoralists would be considered as the herald of the month of hope and prosperity. It is also a thanks giving month for their Waaqa and it is taken as the annually recurred event or holiday. As water is the source of life, admiring creator and its creation, thanking God for the offer is what is performed being gathered around the vicinity. So, the Oromo religion (Waaqeffannaa) from which Irreechaais part has a concept that revolves around rain, peace and fertility. men holding harooressa (male stick) in their hands sing “Irrechoo yaa Irreechaa malkaa roobaafi nagaa! ….,” After this praying, all of them return to their villages accompanying Abba Malkaa and their clan leaders. Children with peer groups sing a seasonal and love song. It is the season in which young people select their girl mates, give and receive /exchange/ gifts with their friends. It is the season when lovers express their best wishes to one another through cultural songs. The historical and religious site of Hora Arsadi where the celebration ceremony is on-going is found adjacent to Bushoftu town not far from Oda Nabe – one of the Oromo religious political and historical centres of the ancient time. Hora Arsadi is named after the man called Arsadi who is said to have belonged to the Liban lineage. According to the tradition, Arsadi who encountered difficult life situation was seeking for the way out. This man stayed in this lake for eight days fasting and praying. However, is said to have been alive miraculously. So the clan leaders decided that this place (site) remains worship site and the season be this particular time of the year for the memory of the alive Arsadi and the mystery of Waaqa. After sometimes, the ritual ceremony that began with such mysterious background passed over to Ada’a lineage of Galan origin. Thus, seniority of giving blessing remained in the hands of the Jiddaclan, followed by other clans according to their seniority. Irreechaa ritual ceremony contains in itself religious and philosophical world view which admires the miraculous spiritual powers of Waaqa and co-jointly relates the living secret of generation. The ever greenness and productivity of plants, the regeneration of life and the replacement of the old by the new, death and resurrection of fruits is likened and related to the wisdom of Waaqa. According to this belief, all is accomplished by the will of Waaqa and is indicative to the life after death religious philosophy. belief in Osiris. However, it seems that the Cushitic belief is embodied in the deity for regeneration and well-being. In all its forms, Waaqeffannaa if not identical, is similar to the worshipping practices of the ancient people living along the Nile Valley. Nevertheless, the Oromo Waaqeffannaa does not believe in deity. But it is a belief in monotheistic power i.e. Waaqa. This, they revere as Waaqa Gurracha. Even though the ancient Cushitic people had common religious back ground, it is difficult to conclude that they had identical belief system. Hence, this is open for further research. But certainly, it suffices to say that both of them originated from the Nile Valley Cushitic civilization. 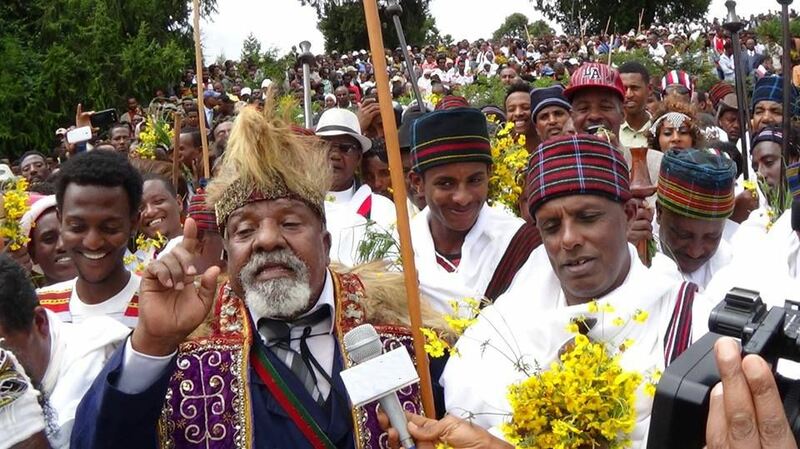 Nevertheless, the Oromo Waaqeffannaa and the annually conducted Irreechaa ritual ceremony are characterized by praising the creator holding its creation (fresh grass, …) in hands. Thus, it is usually said “Uumamaan uumaa kadhannaa”. This literally means we worship the creator having creation in hands. This is accomplished by holding in hands lovely grasses and flowers and offering and admiring good gifts that God has bestowed them. Indeed, this is what is annually done on Irreechaa ritual ceremony at Hora Arsadi.